A great addition for the Stationary Bottle Trees. The sanitizer injector is easy to use, and saves a lot of time. 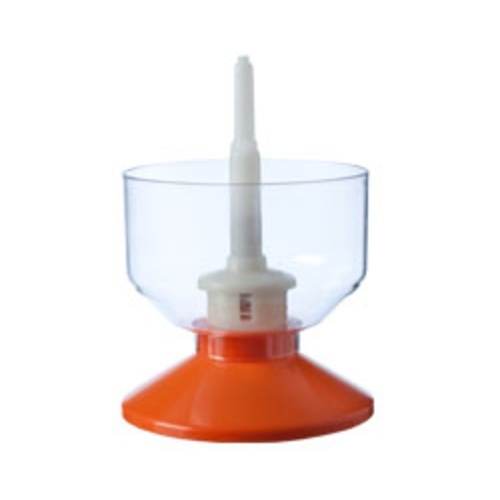 Simply fill the reservoir with sanitizer solution, press your bottle down on the injector spout to squirt sanitizer inside your bottle, and let the bottle dry upside down on the bottle tree. Hoping this helps ease one of the more tedious parts of bottling day. Wanted to eliminate the use of a funnal when quickly rinsing bottles with starsan. Better than submerging bottles in a bucket. This product works great!!! It takes a whole lotta time off of my bottling days. I would recommend this product to anyone who bottles. Works well. Tip seems to have been cut slightly off so instead of spraying diectly to the bottom of the bottle it hits the outer rim of bottom of bottle. Easily counteracted by rotating bottle to get total coverage. Very pleased with product other than that slight miss in the quality control process. I really like this apparatus. My final rinse when prepping bottles for future bottling sessions is with Starsan, and prior to purchasing this, I was using a small funnel to pour a small amount of Starsan into each bottle. This really speeds up the tedium of bottle prep. Product works great on all size bottles with a small amount of StarSan. I don't use a bottle tree so this version is perfect. A few squirts into the bottle then into the fast rack. This is a very efficient way to sanitize bottles. Uses very little sanitizer and is very quick. The reason for deducting one star is the cost-seems a bit high for a squirt gun. I used to run my bottles through a hot dishwasher to sanitize them before bottling. The cycle took an hour and then I had to wait for the bottles to cool. Ugh. This sanitizer injector is a time saver and thoroughly sanitizes my bottles. I recommend using Saniclean rather than Star San with this because it does not foam up. Star San will work, but you will need to scoop foam out of the bowl once in a while. When you're done sanitizing bottles, you can dump your bottle caps right in the bowl to keep them sanitary and ready for use.